Solid state drives are all the rage nowadays, and it is not hard to see why. Not only are they much faster than traditional mechanical hard drives, but they consume much less electricity too. While power consumption might not be a big deal for home users, it can really add up in the enterprise where many drives are in use. In other words, a reduction in energy use can really benefit data centers and other business uses. Today, Samsung unveils a new high-performance SSD aimed at the enterprise. The "SZ985 Z-SSD," as it is called, uses special Z-NAND memory. The drive is designed for The Internet of Things, Artificial Intelligence, supercomputing, and more. With that said, there is no reason enthusiasts can’t use it on their PCs. "The new single port, four-lane Z-SSD features Z-NAND chips that provide 10 times higher cell read performance than 3-bit V-NAND chips, along with 1.5GB LPDDR4 DRAM and a high performance controller. 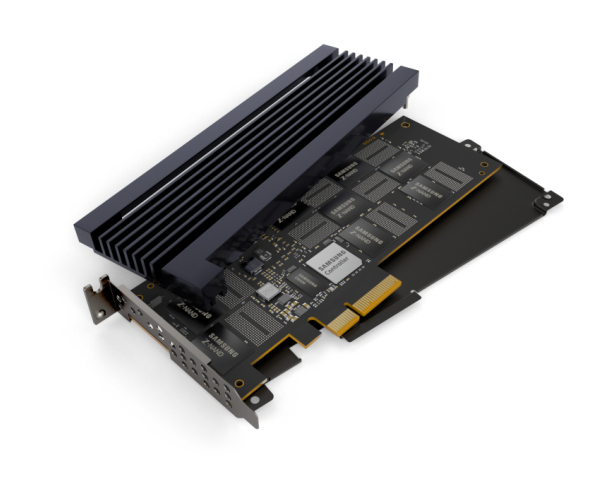 Armed with some of the industry’s most advanced components, the 800GB Z-SSD features 1.7 times faster random read performance at 750K IOPS, and five times less write latency -- at 16 microseconds, compared to an NVMe SSD PM963, which is based on 3-bit V-NAND chips. The Z-SSD also delivers a random write speed of up to 170K IOPS," says Samsung. The company further says, "Due to its high reliability, the 800GB Z-SSD guarantees up to 30 drive writes per day (DWPD) for five years, or a total of 42 petabytes. That translates into storing a total of about 8.4 million 5GB-equivalent full-HD movies during a five-year period. The reliability of the new Z-SSD is further underscored by a mean time between failures (MTBF) of two million hours." Speaking about this new drive, Jinman Han, SVP Memory Product Planning and Application Engineering at Samsung Electronics says the following. With our leading-edge 800GB Z-SSD, we expect to contribute significantly to market introductions of next-generation supercomputing systems in the near future, enabling improved IT investment efficiency and exceptional performance. We will continue to develop next-generation Z-SSDs with higher density and greater product competitiveness, in order to lead the industry in accelerating growth of the premium SSD market. Unfortunately, pricing and availability are not yet known. With that said, Samsung will be showing off the premium drive in San Francisco during the International Solid-State Circuits Conference which begins on February 11. In addition to the 800GB variant, Samsung will also have a 240GB version.